One of Georgia's true hidden gems, Banning Mills is one of Georgia's true hidden gems, Banning Mills is a beautiful spot nestled in Carroll County. Hidden away in a gorge on Snake Creek, this rich historical site has so much to offer. Originally home to Native Americans of the Creek and Cherokee nations, the area was settled by colonists in the 19th century and home to Chief William McIntosh, the only Native American man to become a Brigadier General after the Creek War of 1813-14. With so many stories to tell and beautiful scenery all around, Banning Mills is a super spot to visit, and some of the most enjoyable and exciting activities to enjoy in the area are the local zip line tours. In fact, the Historic Banning Mills Zip Line Tours are among the best-rated activities in the region and have been a huge hit with tourists and travelers ever since they opened up, and one of the tours was even awarded a Guinness World Record in 2012 for being the longest zip line canopy tour in the world! · Level 1: The Forest or Woodland Tour, taking guests along nine zip lines in total, as well as a couple of sky bridges and a tower. This tour lasts for between one and one and a half hours overall and is the cheapest zip line tour option at Banning Mills. Well suited for families, as well as younger and less experienced visitors. · Level 2: The Flight Pattern Zip Line Canopy Tour. Featuring 12 zip lines overall and up to 10 sky walk bridges, plus a tower, the level 2 course is the next step up from the initial zip line tour and lasts between one and a half and two and a half hours overall. Featuring 1,000-foot zip lines flying across Snake Creek Gorge, this tour provides a whole lot of thrills and adventure. · Level 3: The Flight Pattern Plus Zip Line Canopy Tour Course. This level combines both of the level 1 and 2 tours in one complete package. Lasting between two and a half and three and a half hours, this zip line tour is a great way to spend an afternoon, providing a nice mixture of short, simple zip lines and longer, more extreme lines with speeds of up to 60 miles per hour in some cases. · Level 4: The Extreme Zip Line Canopy Course Tour. Letting you fly at heights of more than 100 feet off the ground, this tour isn't for the faint of heart but can let you live in the skin of a true adventurer, gliding from treetop to treetop and taking in some stunning views. This tour takes in even more zip lines than the others and can last up to four hours. · Level 5: The All Day Rush. Got a full day to spare? If so, this is a great way to spend it. This zip line tour features up to eight hours of zip lining excitement! Bringing together all the thrills and spills of the previous four levels in one massive package, this tour is simply unforgettable and you'll forget what it's like to walk on solid ground after spending so long flying through the sky. · Level 6: The Two Day Rush. As the name suggests, this tour takes things to a whole new level by offering a two-day experience totaling around 16 hours of ziplining action overall. Guests will spend all day taking in the sights from dozens of zip lines before stopping off in a Creekside Jacuzzi or cabin. They'll enjoy a wholesome breakfast the next morning before setting off again for even more fun among the trees. You've never had a zip line tour quite like this one. 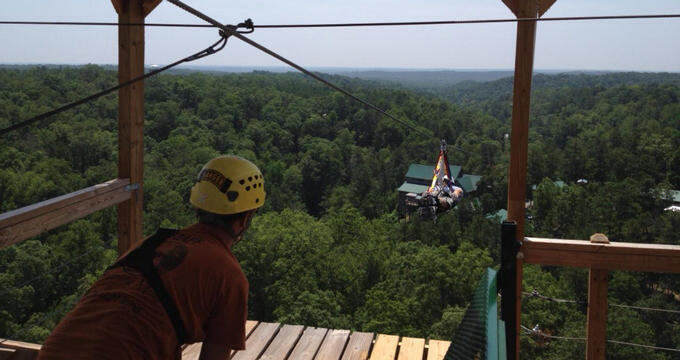 Like with any zip line tour, there are rules and requirements to observe at Banning Mills. Each ‘Level’ of zip line tour has its own restrictions, and as the levels increase in intensity, those restrictions also become stricter in order to ensure that everyone is as safe as possible. The absolute minimum weight limit is 50 pounds, while the maximum is 250 for ladies and 285 for men. The minimum age requirement is 8 and people with mobility or heart issues are not recommended to sign up as these zip line tours require a certain level of physical strength and fitness.